So it’s been a long time since I’ve had a chance to update my blog. The last time I posted on here, the game was just mere months away from release and I was pretty damn petrified. Since then things have been a blur, so much has happened in the last 12 months that I’ve really not had time to reflect on it all, but now I have a bit more free time on my hands I’ve decided to step back and take a closer look at the game’s development, its humble beginnings and the amazing, scary and emotional ride that I’ve been on for the past 3 years. To start off with, I should probably go back to where things all began and how I ended up as a game artist in the first place so that you can get a better idea of how I ended up working on Dear Esther. I really began dabbling in game art back in 2004 when the Half-Life 2’s SDK came out. I’d always been fascinated by game art, but seeing what Valve were doing with Source and HL2 back then really pushed me to find out more about game development. I started out by making a couple of maps that, although not particularly popular, proved to be an invaluable learning experience more than anything else. Building those maps really allowed me to learn a lot about level design and creating art in a real-time environment, the latter being something that I grew more interested in over time. About a year later I joined a mod called Nuclear Dawn, which at the time, consisted of some of probably the most talented people on the modding scene back then, and it was working with those guys that really pushed me to raise the quality of my work further and also gain an insight some of the more technical aspects of game development. At this time I already had a job as a 3d artist, working for a military contractor doing some pretty menial 3d modelling and animation and I was growing increasingly bored of it, the tech we were using was over a decade out of date and I was very restricted creatively. When I eventually found myself working more hours on my mod stuff than I was with my real Job and enjoying it a lot more too, I realised that I needed to change my situation. So in 2006 I decided to quit my job to start working on Nuclear Dawn full-time with the intention of building up my portfolio with enough relevant, quality material to be able to get a job in the games industry. It was during this period that something interesting started to happen; one-by-one, members of the mod team started to get recruited by big game development studios, most notably Dice EA, and it was through my ex-modding friends and the work I had built up in my portfolio with Nuclear Dawn, that I eventually landed a job as a junior Environment Artist on Mirror’s Edge in early 2007. Mirror’s Edge was a fantastic learning experience, especially for an artist still wet behind the ears. Whilst there I learned some important philosophies about how art can complement gameplay and how to think outside the box when it came to environmental design. It also spawned some interesting ideas in my head about how environmental design could be used to tell a story, to bring depth to the experience and how it could be also used to connect to the player on an emotional level. It was also an extremely challenging project; Mirror’s Edge was Dice’s first new IP since battlefield, and we were also on an a very tight timescale – in total less than 2 years from production to shipping, which is pretty damn tight for a AAA title, and all of these elements put a lot of pressure on the team. Needless to say, when the project ended in 2008 I was suffering from some serious burnout. I was finding it hard to motivate myself to move on to another project, and worst of all, I just wasn’t feeling the same spark and passion for my work that I had when I first started out. I decided the best thing to do was to move back home to the UK, take a year out and see if I could rekindle some of the passion that I’d felt a couple of years prior. I looked back on my days as a Modder and how exciting and fun those times were and decided that to help things along I would make a small Source engine mod, but then question was, what could I do? I started trawling through Mod dB for some inspiration, which at the time, before the indie scene exploded, was the best place to find original, cool content and ideas, and that’s where I stumbled across Dear Esther! The original mod (which you can still download on moddb) was a concept that resonated closely with the ideas and philosophies that had been floating around my head for some time; It was all about telling a story through exploring the environment, and making that a gameplay experience in its own right. 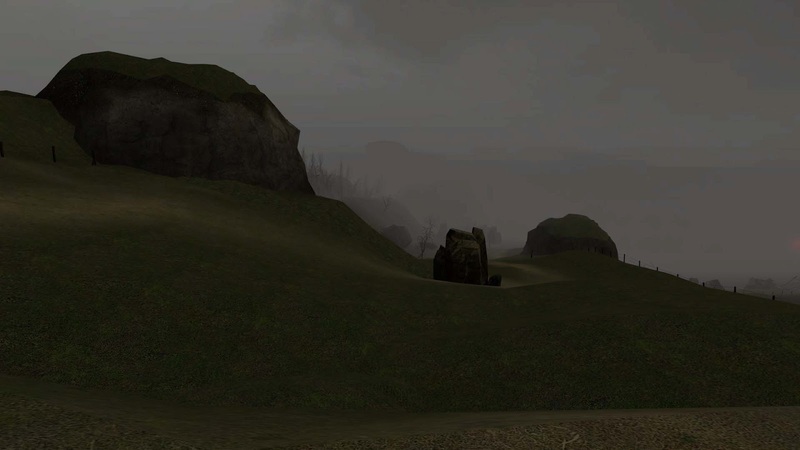 The mod had some great qualities; it had a fantastic soundtrack and some brilliantly read voice-overs, but it was really lacking in one area that I felt was the most vital of all – the environment art. I realised that this was the perfect side-project for me; with an overhaul of the visuals and some polish to the design it could be something really special, and it would also allow me to experiment with all of the ideas I’d had stewing in my head. So I emailed Dan Pinchbeck, the original creator of the mod, about doing a remake and he was extremely supportive, giving me all of the materials I needed to get started and even offering on-going feedback if I needed it. At this point, for the first time in months, I actually felt excited about working on a new project! I kept working for a while longer to save enough money for a year out, estimating it would be no more than 6-8 months to finish Dear Esther, and giving me plenty of time to look for another job after it was finished, and in June 2009 I said farewell to Dice and headed back to the UK, excited to start my year out and my new side-project. The first year of development was probably one of the best. As soon as I was settled back in the UK I started work on Dear Esther straight away, and for the first time in ages I was enjoying just creating and experimenting without any restraint, bringing all of these ideas I’d had to life. One thing I decided from the get-go was that I wanted the development process as open as possible and started by posting regular updates on my blog and Moddb. I felt that by sharing my progress openly, I would be better able to connect to the modding community, and allow them to become more involved with the projects development early on. I could give an insight into how I worked, and in turn the community could leave feedback on any issues or problems they saw along the way. Things were a little quiet at first, but luckily I managed to pick up a few stragglers from the original mod, and the community began to grow from there. The first 6 months were spent mostly testing ideas, finding an art style which worked within the context of the game as well the technical limitations of the Source Engine, and also building a set of base art assets that would be used to start building the environments, and by November 2009 I’d built the first level. At this point I was really happy with how it was shaping up but I was having serious doubts about finishing the project within a year. I actually considered abandoning it at this point and just lobbing what I’d done into my portfolio so that I could give myself time to look for another job. However, after posting up screenshots of my progress online, the feedback from the community just exploded. Suddenly, people were coming out of the woodwork, posting comments and emailing me saying how excited they were for the project, views on my site jumped massively and it all came to a head when I received an email from Valve, inviting me over to Seattle for a ‘friendly chat’. It was a little ominous, but upon arriving I discovered, amazingly, that they’d actually been following the development of Dear Esther for some time and had also been receiving a lot of email about it which is what had prompted the invitation. Just before my visit was over I was offered a job and I was really taken aback; I never really believed I was good enough to work at Valve, not even close, and all of a sudden there I was. It all happened so fast and I was a little overwhelmed at the time, and so I asked them if I could take some time to think about it. On the flight home it began to dawn on me that there was something really special about this project, in a short time it had managed to rally together a large community of really passionate people and caught the attention of a company I had long since admired. As tempting as it was to take the job, I found my curiosity to see what the project could grow into was much stronger. I’d never felt as passionate about a project than I did at this point it time, and I was determined to finish it, no matter what. So when I got home I told Valve how I felt, and amazingly they gave me their full support! With that I dove head-first back into the project with a new found motivation. 2010 started off well, with the art direction established and most of the base art assets built, I was pretty quickly able to blitz through the second level in just over 2 months. The third didn’t take much longer, at around 3 months, and although I was a little over schedule at this point, I was still quite optimistic; I figured that if I continued at the rate I’d been going I’d be easily finished within 6 months, and by cutting back on some luxuries and tightening my belt financially, I could even afford to last another 12 months if necessary. At the end of June, before I posted my progress online, I decided it would be a good idea to send Dan a build to get some feedback on the direction the project was going in. I’d been implementing a lot of my own ideas, designs and interpretations of the original concept, with the caves level being the most drastic of them all, and I wanted to make sure that I wasn’t drifting too far from his original vision. Fortunately, Dan was very supportive of the changes, but he also felt that the project was approaching a quality that deserved more attention and he floated the idea of getting a Source Engine Licence so that we could make it into a standalone title. The idea behind this was to simply reach a wider audience, without the requirement of owning a copy of Half Life 2 and having to go though the fiddly process of installing a mod. I was apprehensive at first. As much as I was on board with reaching a wider audience, up to this point I’d really enjoyed the freedom of just doing the project as a hobby without any outside pressures to distract me, and going indie would change all of that. There would be the pressure of finding funding, license negotiations, royalties, legal fees, etc. and on a personal level there would be the added pressure to make sure my work was good enough for a commercial release, and of course, the additional time it would add to the project. The one factor that concerned me most of all though, was our community; how would they react if to the idea? I decided to find out. In my next development update, I floated the question of what the communities’ thoughts would be on Dear Esther going indie, with the intention of making my final decision based on that feedback. Overall, the response that came back was resoundingly positive; almost everyone was in favour of it and some even vigilantly demanding it! Time-wise, with the project developing as smoothly as it was back then, and with very few changes to the engine code-wise, I figured it would be a simple task of copying over the content to the standalone engine, and that there was still a very good chance we could release before the end of the year. It would further stretch my finances, but with the community behind the idea, I decided we should go for it. Thankfully, Dan generously volunteered to take on organising the licensing, funding, paperwork etc. so that I could concentrate on the game’s development. Six months later, at the start of 2011, things were not looking good; although Dan had secured funding through the University of Portsmouth; we still didn’t have a Source Engine License, and our progress in getting one had been painfully slow. The first response we had back was: “come back when you have a demo and a community that proves its popularity, then we’ll talk”. Which is fair enough really, however, we already had the original mod which had been very successful, and a large community built up around both the original and the remake. So after a bit more badgering and sending them an early demo build, they eventually agreed to talk with us. I can’t discuss figures or go into too much detail due to the NDA we signed with valve, but I will just say that the initial figure they gave us for a license was completely out of our ballpark. It took us a long time before we managed to negotiate a better deal and it wasn’t until the end of January that we finally settled on a figure that we could realistically afford. In the meantime I’d been doing my best to ignore the situation. I’d buried my head in my work, and was finishing up the last level after six gruelling months battling a number of technical and visual difficulties getting such a huge environment working in the Source Engine. In March we were hit with a devastating blow; we’d lost our funding. To cut a long story short, the University’s legal department had some issues with some of the standard liability clauses in the Engine License and refused to sign it. Basically, if there was a chance that someone, somewhere, could sue them over the game, they didn’t want to take the risk, and after weeks Dan trying to cut through all of the bureaucratic red tape, they eventually pulled out completely. I was mortified, everything had hinged on that funding and I never for a minute considered that we might lose it, and now it was gone. I couldn’t face the humiliation of having to go back on the indie announcement, especially after everything we’d been through to get there, but I also couldn’t afford the risk of waiting around in the search for other funding in the unforeseen future. By this point I only had enough savings left to last me another 4-5 months; I’d sold off most of my worldly belongings and was basically living out of one room in my flat to save on heating and electricity. I was deeply depressed and the future of the project seemed pretty bleak. Fortunately, despite all of my doom and gloom, Dan hadn’t given up; as it turned out he’d already been chatting with some of the people at Indie Fund about getting funding for a new project after Dear Esther was completed, and upon the news of the Uni pulling its funds, asked them if they’d be willing to fund Dear Esther instead. They were little hesitant at first, having concerns over how much value the remake would have over the original mod, but with the game pretty much completed in mod-form, I was able to send over a demo of the game to try and sway them in our favour, and fortunately, it worked! In late April they’d arranged a meeting with us I was nervous as hell; this was make-or-break as far as I was concerned, and initially things did not seem to be going so well. Everyone loved the demo, but they saw being more suited for a console audience and that we’d a better return if we released it on the PSN. I really wasn’t happy with that; I didn’t really care about the console audience, Dear Esther, in my mind, was unequivocally a PC title, and there was no way I could turn my back on the PC gaming community that had supported and encouraged us for so long. The meeting ended with an ominous “we’ll think about it…” from Indie Fund, and before I’d had a chance to reflect on what that meant, we got a call back from Jonathon Blow. He basically told us not to worry, and that one way or another, the project would get funded, even if he had to do it out of his own pocket. This was a massive relief and I started to feel a little hope that the project would survive. Fantastically, just a few weeks later, Indie Fund had given us their backing; paperwork was signed and monies were being transferred over, and we’d came out of it with a much better deal than we’d had with the University. Indie Fund was such a refreshing change from the bureaucratic nightmare that we’d been contending with for the past 8 months, everything was so quick and straightforward, even their contract was written in plain English and by June we had a full Source Engine license with enough funds left over to commission a fully re-mastered soundtrack and additional VO’s. Not only that, but amazingly, the University even agreed to give up the IP to Dear Esther and hand it over to Dan’s newly formed indie studio, thechineseroom. Unfortunately, when development started again we were hit with another big setback. In our first build on the new Engine, I discovered a lot of the content from the old Orange Box engine was now completely broken and some features were totally missing. It quickly became obvious that it was going to be a lot more work than I’d anticipated, and there was no way we were going to meet our original estimated release date that summer. And so, reluctantly, I had to set a more realistic date of Xmas 2011. At this point, however, I was completely broke. I had no savings left, and with all of the funding invested into the game, there was no way I could survive long enough to get the game to get released without taking drastic measures. I’d always hated the idea of borrowing money, but at that point I felt there was no turning back. I ordered a credit card and got my overdraft extended as high as it would go. In retrospect it was the stupidest thing I’ve ever done, at the time I had no income and if the game failed, no way of paying it off. It was irrational, but at the time, all I could think about was finishing the game and keeping a roof over my head in the meantime. With the pressure on more than ever, I started working 7 days a week, 18 hours a day and only leaving my flat when I had to buy food. It took until the end of August before the game started to shape up again, and in early September we decided to enter into the IGF 2012 competition. It was risky; the deadline was only a month away and there was still so much we needed to do, but it also offered a fantastic opportunity to get the game into people’s hands and get some outside feedback for the first time in years. So I crunched some more, and During October the game really began to come together; all of the content was back in, the new Music and was in, and it was finally starting to look like a proper game. We submitted it mere hours before the deadline and with the finalists not being announced until January I put the whole thing to the back of my mind. Fortunately, the push to enter into IGF meant that, for the first time ever, the game was ahead of schedule and in November we had our very first beta build on Steam. This, for me, was a huge milestone, seeing the game up on Steam gave me an immense sense of pride; that soon, something I’d made would played by people all over the world! At the same time we were talking release dates, and although it looked like we’d hit our December deadline, Indie Fund and our contacts at Steam, strongly advised against releasing around Christmas due to decreased press activity and also the risk of being buried under an avalanche of Christmas sales. So we had to delay again, but after nearly three years of development, a couple of extra months didn’t seem like a big deal any more, so we eventually settled on February the 14th, Valentine’s Day. By early January the game was pretty much completed, and with the project winding down, I’d been grabbing as much freelance work as I could to keep myself afloat. At this point the reality of the financial mess I’d put myself in had fully kicked in; I remember lying awake at night, calculating how many sales we’d need to make so that I could at least pay-off my debts. At the time I think it was around the 10,000 units, and I remember how that felt like such an impossible number. At this point we only had a very conservative estimation on how it would perform, expecting it to end up being a very niche title. I remember launch night well – I gathered together some of my closest friends for a bit of a party, well, when I say ‘party’ I really mean a pizza and a bottle of ASDA’s finest (cheapest) Champagne, but the plan was to have a few drinks and watch the live sales figures come in from Valve, but unfortunately, for the first few hours, it didn’t actually work. So I just ended up catching up with my friends for the first time in months and getting ridiculously drunk and instead. I woke up the next day with a stonking hangover and rolled out of bed to see if the stats page had come back online. I remember sitting there, in my pants, dehydrated and dishevelled, just staring at the screen in disbelief; in less than 24 hours we’d sold over 16,000 copies of the game, and by the end of the week it was up to 50,000 – it was unbelievable! The next few weeks were very surreal, in March we exhibited the game at GDC, and then went on to win an award at IGF – It was an incredible and humbling experience for all of us I think, just meeting the fans of the game, members of the community who’d supported the project throughout its development was amazing, and also hearing people who I’d admired and respected in the games industry telling us how much they loved Dear Esther. On the plane home from San Francisco, I remember all of the worry, stress and self-doubt finally melting away, like a massive weight was lifted off my shoulders. It finally felt like all of the hard work, blood, sweat and tears put had been worthwhile, but most importantly, that, the instinct I’d felt all along that there was something special about Dear Esther was proving to be true. Since then Dear Esther has sold over a quarter of a million copies and is still going strong. So what was our secret? How did Dear Esther become such an overnight success? I think the truth is there was no ‘overnight’ success. I believe a lot our success came from the way we approached things early on: Building a community through open development and allowing word of mouth to raise awareness of the game and get people talking and involved in its development. I also think that the sheer passion, dedication and hard work that everyone put in shows through the game, and it’s that passion that goes away with the player when they go and talk about it with their friends. We had no marketing campaign, we never had the money; instead, it’s been this word-of-mouth that’s proved stronger than any kind of expensive PR campaign we could have organised. Finally, I also want to say that I really believe that Steam has also been a vital part of our success. It’s a gateway that allowed us to reach millions of gamers all over the world, and although we still sell Dear Esther through our own website and several other online stores, for us, Steam currently accounts for over 99% of our total sales, which I think is a testament to how powerful a tool it is for reaching gamers. I’ve recently been especially pleased to see Valve opening up the submission process with Steam Greenlight. It’s still finding its feet but trust me; it’s a hell of a lot better than how things used to work! Plan ahead – If you’re going indie or not, the same rule applies: Take whatever estimate you have in your head and double it, then add 6 months on for good measure; things rarely ever go exactly as planned, so be prepared! Funding – Don’t go chasing funding with nothing but an idea! Make a demo, something that demonstrates your basic gameplay concept and art direction, release it and get as much feedback as you can from the community before taking it to a potential investor. Most importantly; make sure you are financially secure before you start! Be sure you can support yourself for the estimated time you think it will take to complete, and if you can’t, then wait until you can. So that’s my retrospective/postmortem-y look back on my journey through Dear Esther’s development. I guess if I had to find some words of inspiration from the experience they’d be; don’t give up, don’t restrain your ideas in order to find success – let your ideas guide you and inspire you in your work. When you feel a passion for what you do and you put that passion into your work, the chances are others will feel it too and your success will follow not far behind.